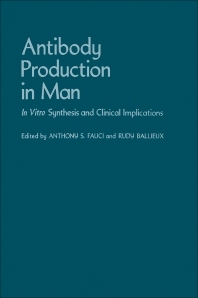 Antibody Production in Man: In Vitro Synthesis and Clinical Implications is composed of the proceedings of the Catharijne Conference on immunology held in Utrecht, Holland on March 15-18, 1978. The conference focuses on the in vitro induction and regulation of immunoglobulin and antibody synthesis by human lymphocytes. It aims to present, analyze, exchange, and criticize data among the different investigators and to attempt to resolve apparent inconsistencies and contradictions. The book first discusses the mitogen- and antigen-induced B-cell activation. It then explains the subpopulations of lymphocytes involved in the regulation of in vitro B-cell function and the clinical implications in the study of in vitro B-cell function. This book reflects the stimulation as well as the frustration during the workshop. It will serve as a small force and focus of direction in this most interesting, complex, and relevant area of human immunobiology. General Discussion Mitogen-Induced B-Cell Activation. I. General Discussion Mitogen-Induced B-Cell Activation. II. General Discussion Antigen-Induced B-Cell Activation. I. General Discussion Antigen-Induced B-Cell Activation. II. 16 Distinct Human T-Cell Subpopulations Regulating the Antigen-Induced Antibody Response General Discussion Subpopulations of Lumphocytes Involved in the in Vitro Regulation of B-Cell Function. I. General Discussion Subpopulations of Lymphocytes Involved in the in Vitro Regulation of B-Cell Function. II. General Discussion Clinical Implications in the Study of in Vitro B-Cell Function. I.